Please. You didn't really think I was done overusing all the spices we brought back from Bangkok, did you? It started with Dominique telling me there's a Doughnut Plant in Brooklyn now and me responding that the Doughnut Plant here just really isn't as good but I still go because doughnuts, y'know? And also the only other place I know to get doughnuts is Paris Baguette. Suddenly I wanted doughnuts, good doughnuts, like, RIGHT NOW. I made a ton of sufganiyot for Chanukah but that wasn't what I wanted and I didn't have the patience to wait for all that rising and shaping and assembling, my need for doughnuts was overwhelming and urgent. Then I remembered I'd recently bookmarked a cruller* recipe in one of the cookbooks I've been reading and I realized suddenly I could have doughnuts in no time! Or about an hour, which is way sooner than I'd have them waiting for dough to rise. I did a few different sizes of these and I liked the mini ones piped in a double ring the best. Not only did they look good but they lasted a little longer out of the fryer. Crullers are definitely a consume within two hours sort of doughnut. What makes crullers different from other doughnuts is that they're made with pate a choux instead of a yeasted dough. So if you've ever made profiteroles, eclairs or gougeres then you're most of the way to knowing how to make crullers! This basic recipe can be made in endless variations if you're not quite as obsessed with five spice as I am right now. *Apparently we have multiple types of crullers in America. These guys are what we would call French crullers though actually they're based off a Viennese spritzkapfen recipe. Special Equipment: A candy/deep fry thermometer, piping bag, medium star piping tip (I used a closed tip similar to this one but I bought it in Korea so I'm not 100% sure of its Ateco equivalent, the original recipe I used recommends this one), parchment paper and a large heavy bottom pot or dutch oven for frying. In a small sauce pan heat the milk just to a simmer. Add in Thai tea. Remove from heat and cover and steep ten minutes. Strain out tea and add finely chopped peppers to the infused milk, let cool to room temperature. Sift powdered sugar into a large bowl, whisk in milk slowly until you reach the desired consistency. Use immediately or store with plastic wrap directly touching the surface of the glaze. Bring the water, butter, sugar, salt and five spice to a full boil in a medium heavy bottomed pot over medium heat. Add in the flour and stir with a wooden spoon until it forms a ball. Reduce the heat and cook for about another two minutes, stirring constantly until the dough creates a film on the bottom of the pan. Move the dough into a large mixing bowl or stand mixer bowl and add in the eggs one at a time. I like to crack them into a ramekin before adding them into the mixer because I'd be lying if I said I hadn't accidentally dropped half an egg shell in the bowl before. The goal is to make a stiff shiny dough that holds its shape. Whether you incorporate three or four eggs will depend on how much moisture you cooked out in step one. Move the dough into a pastry bag fitted with a star tip. Attach a deep fry thermometer to a large heavy bottomed pan or dutch oven (I always deep fry in my dutch oven) and fill with 3 inches of oil. Heat the oil over high heat to 374 degrees Fahrenheit or, if it's marked on your thermometer, the deep fry line. While the oil is heating, cut fourteen 2.5" parchment squares and line them up on your work area. Pipe a double ring inside each square. Set up a wire rack over a sheet pan next to your frying area for cooling and draining. Now it's time to fry. Place the dough circles, two to three at a time, into the oil still attached to their papers, dough side down. After twenty seconds use tongs to peel off the papers (this is tricky the first few times, but you'll get the hang of it). Fry an additional minute and thirty seconds before flipping over. Fry another two minutes and use tongs or a slotted spoon to remove to the rack. 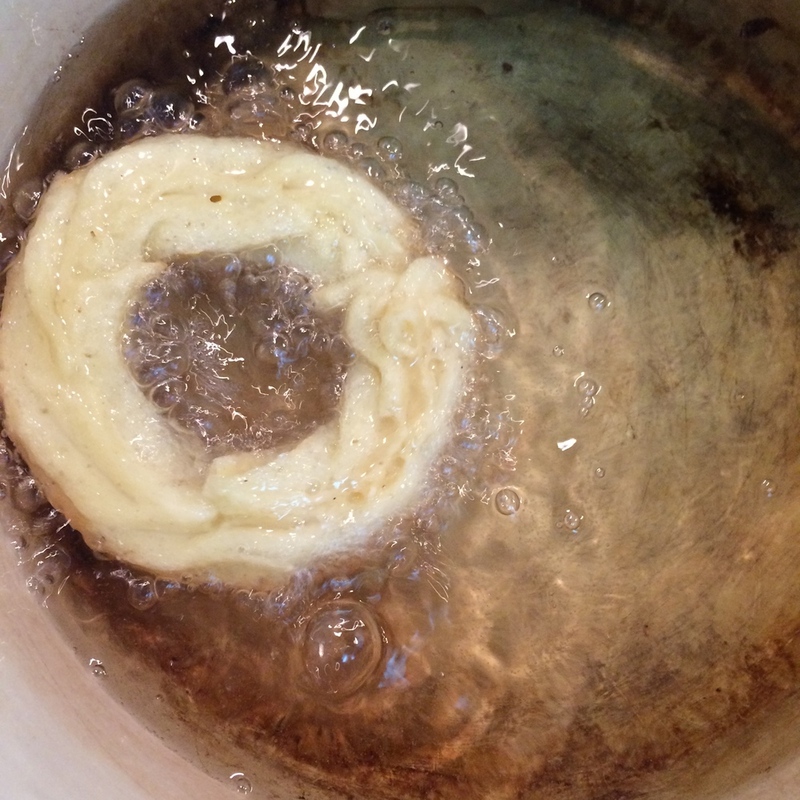 Repeat until all the crullers have been fried, pausing between rounds to reheat the oil to 374 if necessary. Serve within one to two hours.